Reports coming out of Macau show that high rollers seem to have bounced back from a crackdown introduced by Chinese President Xi Jinping in his desire to combat anti-corruption and money-laundering. Three of the biggest gaming operators in the Chinese gambling enclave, namely Wynn Macau, Melco Crown Entertainment, Galaxy,) and Sands China, all showed that their numbers improved significantly during the course of last year, especially when looking at players with fat bankrolls. According to South China Morning Post, Macau high rollers have had a reasonable amount of time to adjust their playing methods and gaming sessions to the president’s new rules, and are now back in the larger casinos. Since the crackdown was introduced around three years ago, the gambling industry in Macau has taken a serious knocking. During those years, thousands of high-profile Chinese gamblers, including business tycoons and military staff, known as tigers, found that their lives were literally under scrutiny by the government as authorities tried to suppress what they considered extravagance and graft. Official government data shows that the prosecution of Chinese officials under the new anti-graft laws has slowed down for the first time since 2011. The chairman of Melco Crown, Lawrence Ho-Yau-lung said in an interview recently that the improved numbers come as a direct result from the government’s loosening of its crackdown. Others say that the marked improvement in China’s property market contributed to greater confidence overall. During the last three months of 2016, VIP gambling revenue climbed 13% to $4.16 billion, reversing the continued slump for the first time in three years. This was good news for an industry that saw the money spent in Macau casinos shrinking by more than half in the past few years. Industry analyst, Chelsey Tam, told the newspaper that, through conversations with industry participants in the VIP segment, there is clearly a “cyclical VIP recovery” on the cards. 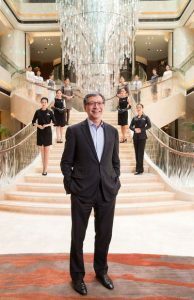 The president of Wynn Macau, Ian Coughlan, also saw a marked improvement at the casino’s VIP tables, especially baccarat.